External rotation of the upper arm: The infraspinatus muscle helps rotate the upper arm to the outside at the shoulder. One of the most common, everyday tasks that requires the infraspinatus muscle is raising your arm up to brush your hair. Stabilization of the shoulder joint: The infraspinatus works with the other rotator cuff muscles to stabilize the shoulder joint and keep the head of the humerus from slipping out of its socket during shoulder movement. The infraspinatus gets some help with its job from some of the other muscles in the shoulder. The teres minor and deltoid muscles assist with lateral rotation of the arm, and the other rotator cuff muscles team up to assist with stabilizing the shoulder joint during various arm movements. When it is injured it can be painful to pull the arm backwards, reach straight out in front of your body, or grab your seatbelt. Most people are surprised by how much the infraspinatus muscle is involved in their daily activities until they strain the muscle, and feel the pain with use. When the muscle is hurt the pain can radiate from the shoulder blade to the side of the shoulder. 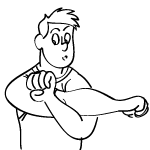 The muscle can be tender at the injury site, or radiate down the arm. A dull ache that becomes sharp with movement is common. A bad trigger point will radiate down to the elbow. A trigger point is an area of muscle that has been injured to the degree that it radiates pain to other areas. Mild muscle injuries hurt at the location of the injury only. Worse injuries radiate pain a couple inches. Bigger muscle injuries radiate pain to other areas of the body. The rotator cuff is a group of four muscles that combine at the shoulder. 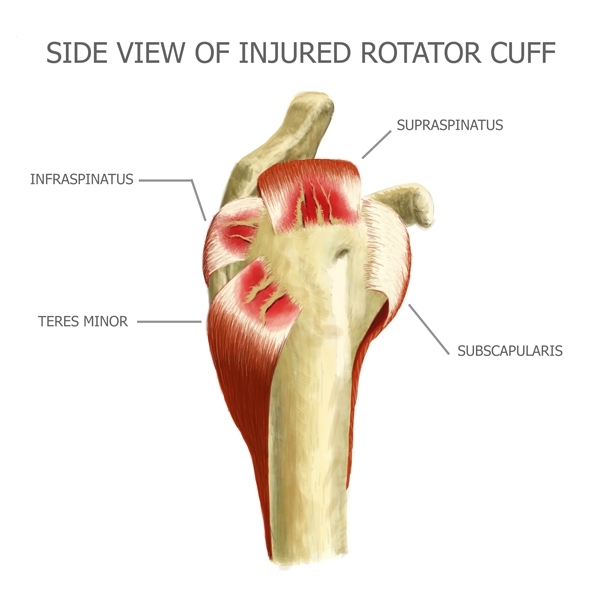 The muscles of the rotator cuff provide the greatest range of motion of any joint in the body. The four individual muscles keep the shoulder joint stable. These muscles control the elevating and rotating motion of the arm. The names of the four muscles are the supraspinatus, infraspinatus, teres minor and subscapularis. 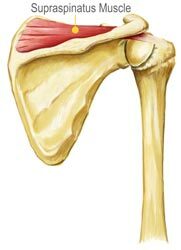 The supraspinatus elevates the shoulder joint and works with the other muscles to keep the head of the humerus bone stable within the shoulder joint. The supraspinatus muscle resists the gravitational pull on the shoulder created by the weight of the arm. This muscle is the most commonly injured of the four rotator cuff muscles. The infraspinatus along with the teres minor controls external rotation of the shoulder. It carries the arm backward. The infraspinatus also helps keep the humerus bone stabilized in the shoulder joint. This muscle is the second most frequently injured of the four rotator cuff muscles. 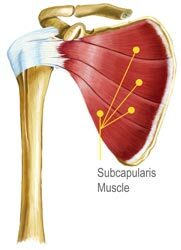 The subscapularis controls in the internal rotation of the head of the humerus. It brings the humerus forward and down when the arm is raised. 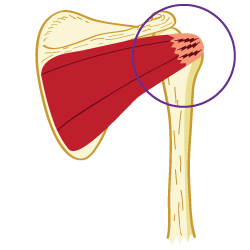 The subscapularis provides strong protection to the front of the shoudler joint and prevents displacement. 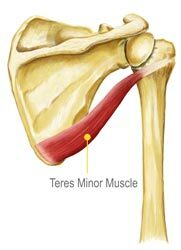 The teres minor, along with the infraspinatus, acts to rotate the arm in an outward manner. It works with the other rotator cuff muscles to keep the shoulder joint stable. The term "teres" means smooth in Latin. It is easily fatigued and can sometimes cause pain in the third and fourth fingers. Infraspinatus tears can be caused by an acute injury (one-time incident) or from wear and tear of the tissue over time (also known as a degenerative tear). Lack of blood supply -- Our blood flow circulation decreases as we age. Lack of proper blood supply could cause a weakened infraspinatus muscle, making it more vulnerable to tearing. Shoulder Pain: Front of shoulder pain is one of the first symptoms noticed when it comes to infraspinatus injuries. The pain often feels like it is deep within the shoulder joint. 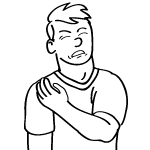 Pain may also be felt down the side and front of the arm all the way down to the fingers, on the inside corner of the shoulder blade in the upper back, and in the back of the neck. Pain when reaching behind the back or reaching overheard: Some people report that they are unable to reach behind their back to fasten a bra or get their wallet out of a back pocket. These movements require significant internal rotation of the shoulder, which stretches the tense muscle and aggravates the trigger points within it. Pain may also occur when trying to reach overhead to perform a task such as grabbing something off a high shelf or painting a wall. Inability to raise arm up to head: Reports that people are unable to raise their arms to wash their hair, brush their teeth, or even bring food to their mouth while eating. 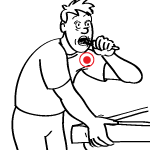 Inability to push with arms: Complaints of shoulder pain are reported when using their arms to push up out of a chair or when pushing up out of bed in the morning. 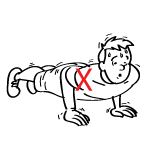 Weight lifting exercises like the bench press, inclined bench press, and military press are nearly impossible with active infraspinatus trigger points. 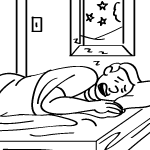 Shoulder pain at night: Infraspinatus trigger points can be a double-edged sword when trying to sleep on your side. If you lay on the affected shoulder, the weight of the upper body can compress the trigger points and produce referred pain. If you lay on the unaffected shoulder, the upper arm may hang down in front of the body and place the affected infraspinatus in a prolonged stretched state, aggravating the trigger points again. In severe cases, you may be forced to sleep in a sitting position to prevent the pain from disturbing your sleep. Bicepital Tendonitis: The role that infraspinatus trigger points play in many cases of bicepital tendonitis deserves special mention. This condition is characterized by tenderness and pain in the biceps brachii (front) region of the upper arm, and is prevalent in baseball pitchers, football quarterbacks, and tennis players. There haven't been many cases of bicepital tendonitis, but every case was easily resolved by deactivating infraspinatus trigger points. Shoulder weakness & stiffness: You may notice that your shoulder joint seems weakened, making it difficult to perform the tasks you used to. You may also notice that your range of motion is reduced. Some infraspinatus injuries are so severe that the shoulder becomes nearly 100% immobile, which can lead to a condition called Frozen Shoulder. This weakness and stiffness can sometimes affect the arm as well as the shoulder. Shoulder pain that is short-lived may be evaluated by a family doctor. See your doctor right away if you have a sudden loss of motion after an injury - you could have a substantial rotator cuff tear. If you have pain lasting longer than a few weeks or you've been formally diagnosed with a rotator cuff tear, you need to be seen by a shoulder specialist, because some of the surgical procedures are time sensitive. Rest: Following an injury, the first thing that should be done is to rest the affected area. Immobilizing the shoulder area will allow your body to begin healing the infraspinatus. Just like a cut that scabs over, internally your body does the same thing. While complete rest isn't always possible, you will want to avoid any activities that could cause further strain of the infraspinatus. 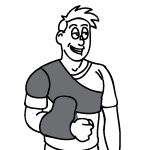 Using a sling can help make immobilization easier. Cold Compression: Cold and compression applied at the same time will help reduce the inflammation and is the first step towards healing. Cold is essential for relieving pain and compression works to reduce inflammation. When you reduce the inflammation, the blood will be able to travel more freely to the injury site. 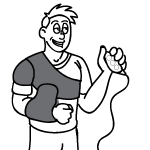 We recommend using a cold compression wrap that is designed for the shoulder, so you get the best possible coverage and fit. Increased Blood Flow: Devices are available, and are much better options, that are specifically designed to generate optimal blood flow to the affected area. Increased blood flow will bring nutrient-rich blood to your injured infraspinatus, helping to speed up your recovery. While physical activity promotes blood flow, when you have an injury like an infraspinatus tear, you want to avoid most physical activity in order to prevent re-injury. Devices that stimulate your blood flow allow for increased circulation while you are completely at rest, so you can accelerate healing and avoid re-injury at the same time. 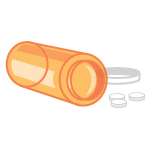 Painkillers: Painkillers such as aspirin, ibuprofen and acetaminophen should only be used if daily activities are completed. Using painkillers to 'get through the day' is not good. Masking pain will cause more damage that won't be felt until the medication wears off, and extends your recovery time. 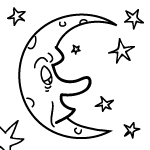 If you need to take painkillers, try to limit them to times when you're at rest, such as when you're sleeping. It's important to note that while NSAIDs (non-steroidal anti-inflammatory drugs) like Advil and Aleve help relieve pain as well as inflammation, analgesics like Tylenol only address the pain. If you want to address both the pain and the inflammation, use an NSAID. Physiotherapy: A physiotherapist can show you exercises that will help you ease back into using your shoulder. Stretching and strengthening exercises will ensure that the muscles stay strong and that they don't start deteriorating. They will also improve your range of motion. The most common cause of a secondary injury is due to the fact that the muscles haven't been maintained properly. Just make sure you aren't doing stretching and strengthening exercises too soon in the healing process, or you will undo your recovery and set yourself back to square one. Steroid Injections: If your pain and inflammation are still bothering you after trying other treatments, your doctor may recommend corticosteroid injections (also known as cortisone shots). While this will temporarily provide relief, it doesn't do anything to heal the tear itself. Cortisone shots also come with various risks and side effects, the most concerning of which is tendon rupture. That is why it is only recommended to have 3-4 cortisone shots into an area of the body in the space of a year. Other risks include bone death, skin discoloration and infection. Taping your infraspinatus can help provide your damaged tissues with bonus support and protection. This works to help prevent re-injury. Sports tape can be worn during all of your daily activities but is particularly effective when worn during exercise. The taping application below is just an example. While we found it effective for infraspinatus injuries, please feel free to try out various applications in order to find the one that works best for you. There are plenty of tutorials and instructions online. Just remember to pay attention to your pain. If you're feeling pain in a specific area of your shoulder, apply the tape there. The taping application below was applied over clothing for demonstration purposes. It is intended to be applied directly over the skin. Since the tape needs to be applied to the back of your shoulder, you will likely need someone to help you. Before taping your shoulder, make sure the area is dry and free of any lotions, oils or dirt. 1. Take a full length piece of tape (about 10 inches) and tear the backing off one end. 2. Using no stretch, anchor the tape just below the bone that protrudes from the side of your shoulder. 3. 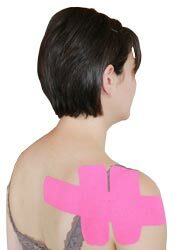 Remove the rest of the backing from the tape, and using 25% stretch, pull the tape towards the back of your shoulder, going just below where the top of the shoulder blade protrudes. Lay down the end of the tape with no stretch. 4. Take another 10 inch piece of tape and cut it in half, rounding the corners, so you have two 5 inch strips of tape. 5. Take one of the 5 inch strips and tear the backing in the middle, peeling it away so you are holding onto the two anchor ends. 6. Using 80% stretch in the middle and no stretch at the ends, apply the tape vertically along the side of your shoulder. 7. Take the other 5 inch strip of tape and tear the backing in the middle, peeling it away so you are holding onto the two anchor ends. 8. Using 80% stretch in the middle and no stretch at the ends, apply the tape vertically right beside the one you just applied, but closer to your shoulder blade. 9. Rub the tape into your skin to make sure it sticks. 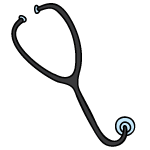 First, your doctor will ask you to describe your symptoms and how long you've been experiencing them. 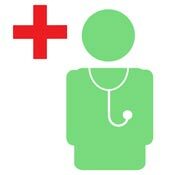 You may also discuss your medical history, in case your current injury is related to a past injury or another medical condition. Then your doctor will examine your shoulder. You may have to change into a gown so your doctor can compare your injured shoulder to your healthy shoulder. This will indicate if there is inflammation or any deformity present. In order to confirm a diagnosis, your doctor may send you to get an MRI or ultrasound. These imaging tests can indicate whether there is a tear, how severe the tear is, and how long you've had the tear. Your doctor may also send you to get x-rays if he or she suspects you may have another condition, such as arthritis. While soft tissue (like the infraspinatus) shows up in MRI and ultrasound imaging tests, it does not show up on x-rays. 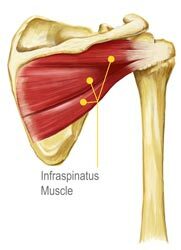 Because it has a poor mechanical advantage, the infraspinatus is a relatively weak muscle in most people. If it is called upon to suddenly perform heavy exertion, it can easily strain or tear. Some people have a minor strain of the infraspinatus tendon that continues almost unnoticed for years. They may experience slight discomfort when reaching for something on a high shelf or into the back seat of the car. However, when this minor lesion does not heal properly, it can set the stage for a more severe injury later. 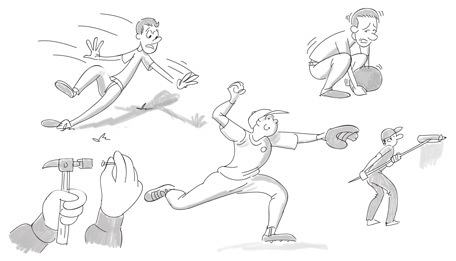 When a strain of the infraspinatus tendon occurs, the person frequently feels nothing at the moment because the tendon is warmed-up or because the person is focused in the heat of the moment during an athletic activity. Later that day or the next morning, difficulty putting on a shirt or coat may occur, as the arm is lifted up and out to the side. With infraspinatus tendonitis, pain is felt in the upper-arm region, sometimes slightly toward the back of the arm, but not always. When the injury is severe, pain can travel to the wrist. During the verification tests for this injury, pain will often be felt down the back, front, or outside of the upper arm and occasionaly over the scapula. Severe infraspinatus tendonitis sufferers may complain of pain down the arm as far as the wrist, but this pain pattern occurs only in extreme cases of this injury. Two to three months of rest will sometimes allow infraspinatus tendonitis to heal, but more often it will remain for years, especially in an active person. Tendon injury exercise, along with rest may improve the condition. Treatment is usually recommended if rest and exercise don't elimate the pain in the course of a month. Hitting backhand in raquet sports is not a good idea while in treatment, nor are any exercises that cause pain such as push-ups and chin-ups. Most infraspinatus tears won't require surgery in order to heal. Surgery should always be considered a last resort. However, if you have a full tissue tear (called a rupture) or if conservative treatment (RICE, pain medication, physiotherapy) has failed to help you after 6-12 months, you may be a good candidate for surgery. This also applies to people who have complex tears involving more than one muscle or tendon. Infraspinatus repair surgery is usually successful for those who are relatively young and healthy. You will most likely undergo something called arthroscopic surgery, which involves a tiny tube with a camera at the end being inserted into a small incision in your shoulder. This will allow the surgeon to look at the tissue damage and perform the surgery. Several other small incisions will be made in the shoulder for the surgical tools. 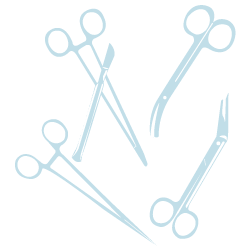 During the procedure, the torn tissue will be sewn back together. If the injury involves any tissue that was detached from the bone, this will be secured back in place. If your tear is quite large or you have a complex rotator cuff tear, your surgeon may have to perform open repair surgery. 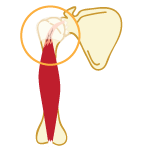 In an open repair procedure, an incision is made in the shoulder and the deltoid muscle is moved to allow the surgeon to perform the repair. After the procedure, you will be stitched up and a dressing will be applied to your shoulder. The latest procedure when it comes to rotator cuff surgery is called a mini-open repair. This procedure eliminates the need to detach and move the deltoid, as it involves a smaller incision as well as the latest tools. First, an incision is made and an arthroscope is used to look at the damage within the shoulder. If there are any bone spurs, they will be removed at this time. Then the arthroscope is removed and the tissue damage is repaired through the mini-open incision using surgical tools. You will probably have to wear a sling for several weeks following the procedure. Recovering from infraspinatus surgery can take up to 6 months depending on the severity of the tear and the type of procedure you undergo. Physiotherapy can help you restore strength and range of motion to your shoulder following surgery.